Howmet TX, turbine car's finest hour! Say hello to the Howmet TX. It is in fact one of the few turbine powered race car ever made, and the only one to ever win a race. This post is about its history, and development. If you don't like car history, please move on because it will be a long article. For those that do, enjoy! Conceived by Heppenstal with help from his friend Tom Fleming. Heppenstal had made a name for himself racing in the Ford Falcon Sprint sponsored by Howmet. This is how he got to know people like Fleming at Howmet. Fleming helped convince the board of directors at Howmet to fund the project to help promote the company. Never heard of them? Well that is okay, they don't actually make cars. They specialize in investment casting of superalloys, aluminum, and titanium. They usually do this for jet engines and gas turbines. They have been around since 1926 and are a subsidary of Alcoa. Not the most interesting stuff, but this is important to know the company backing the racing team. While thinking of the car, Heppenstal realized that he would need a smaller, lighter engine than those used in Indy car at the time. So he found Continental Aviation and Engineering Corporation. The engine they had was originally going to be used to power US military helicopters. The contract ended up falling though and the company was left with 10 engines. These engines were then used to power the Howmet TX. The only modification need to convert this military engine to be able to use in a car was a wastegate. This wastegate helped the response of the engine immensely. The acceleration lag without the wastegate was nearly 3 seconds! This is the engine. The smallest pipe is for the wastegates. This is on chassis #2. On chassis #1 the wastegate pipe is on the left rather than in the middle. The engine itself only weighed 170lbs in total. It could produce upwards of 400 horsepower. Since it has only 3 moving parts, it could rev more freely than a piston engine, all the way up to its 57,000 redline. It produced 650 pounds feet of torque. The engine itself is set up with a two stage system. It is fairly simply. This diagram should explain everything. Basically there are two shafts. One is connected to a compressor, and the first turbine. Then the air is sent to the second turbine and the second shaft, which then transfers the power to the transmission. The starter is there to help the compressor rotate. "It is quite elementary Watson." Now, measuring displacement of a turbine engine is different then a piston engine. The FIA used an equivalance formula to determine the displacement. They said 2960cc, or 3L. 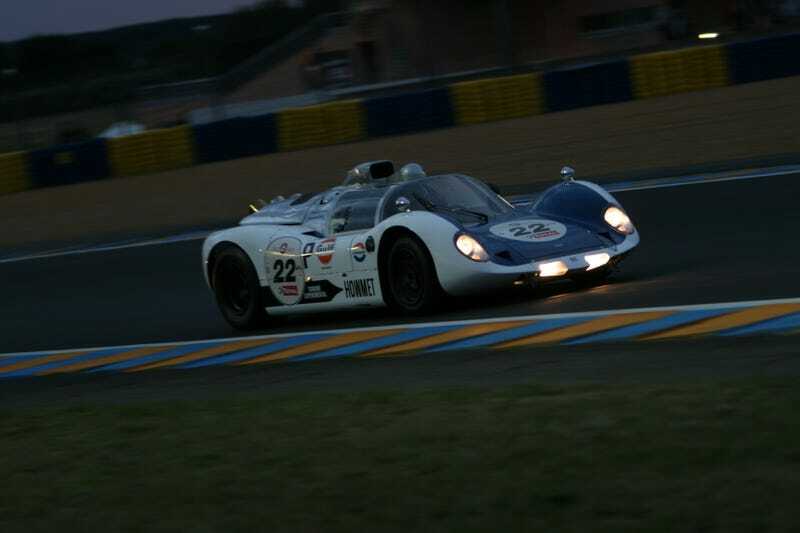 It raced as a prototype under 3000 cc category of the Group 6. Turns out that this was wrong. Heppenstall has admitted that the car actually displaced around 3.3L. There is a story that apparently the FIA took his word on the engine displacement because the military drawings of the engine were classified at the time, so they may have not measured it at all! Due to its high variable output of the turbine, a standard gearbox was not needed. Instead it used a one speed transmission. This meant that there was no reverse. FIA mandated there be a reverse gear. Heppenstall didn't want it. Instead of fitting a reverse gear, there is an electric motor helped the car back up. The original idea was to buy a Cooper Monaco, but that idea was scraped and the Monaco he bought was sold. Then Heppenstal contacted Bob McKee. He asked McKee to make chassis for him. Using steel tubular space frame, McKee made to different chassis. The first chassis were based off an Can Am car McKee had made. The second chassis was made specifically for the turbine powered project. It is 2 inches longer. The body is much simpler, it is quite literally just aluminum built around the body with fenders being made of fiberglass. That isn't all though, there is a connection. A German connection. When styling the car, Bob McKee had a spare Porsche 906 windshield laying around. He then welded this to the chassis and made the coupe body around the windshield. In total, engine and body, the car weighs a mere 1500 pounds. This helped gain a weight advantage over the competition and the car could cover the quarter mile in a scant 11.83 seconds. That is fast by today's standards, that is fast by supercar standards! It also sounds like an airplane covering that distance, must be exciting in the car. The car made its debut in 1968 at the Daytona 24 hours. It was in 3rd after 7 hours of racing, until the wastegate did not close and the car plowed into a barrier. Next was Sebring 12 hours, where it qualified 3rd. It then was pulled from the race, when debris caused damage to the engine. The next two races also ended up with the car retiring at BOAC 500 at Brand's Hatch and a British Championship race at Oulton Park. Then, back in America, the car would obtain it's first race victory, not only for it but turbine powered cars in general! At the Heart of Dixie race in Alabama, it won both the sprint and feature race. It also set a lap record there as well. The next race, Marlboro 300, it won again and setting the lap record there as well. The cars were ready to try World Championship scene again. At the 6 hours of Watkins Glen the car driven by Heppenstal came in 3rd overall and 1st in class. Next was the torturous Le Mans 24 hours. The car was modified to prevent bugs and debris from entering the engine. The biggest problem though was the rules. Le Mans mandated that all cars be shut off when in the pits. So it become very difficult to start the engines back up. They tried and cool the engines by putting ice on them. In the end, the engine was damaged and the car was limited to 100 mph on the straights. This was going to be the last races for these amazing cars. Howmet had gotten a lot of coverage from the media even before racing began, and thought that the racing program was of no use for further advertisement. So the cars were retired. Although the racing program was discontinued, Howmet though that they could still promote their company. The redesigned the body to chassis #2 and made it an open top car. It is known as the Howmet TX MKII. It weighed in at around 1000 kg and could have added or lost weight to attempt FIA world record runs for cars under or over 1000 kg. It was fastest in 1/4 mile, 1/2 kilometer, and 1 kilometer runs, for both under and over 1000 kilogram cars. I would love to show you a picture of the Howmet TX MKII, but there are none. I could not find any on the internet. I did however find this model. It is good to know, that both cars are in working condition. That is the beauty of the turbine engine. Less moving parts means a much smaller chance of engine failure. One is in Europe with an Allison 250C18 engine rather than the standard Continental unit. There is now a third car! Made in 2000 by Bob McKee with a spare chassis. The car does not have wastegates, which would make it more functional. The Howmet TX is a great example of what turbine power can do. The small development time, followed by success in racing showed what could have been done if the car was given more time to correct some of the flaws. Maybe if there was a funder that was more devoted to the project the car could have been a serious contender, the year after! The car is a great piece of history and definitely did what it set out to do!